Sultan Silgimix Alginate Replacement Impression Material, 50ml 1:1, 8/pk. Silgimix™ is a vinyl polysiloxane material that is used for making impression study models, orthodontic models, counter impressions, provisionals, bleaching trays and more. 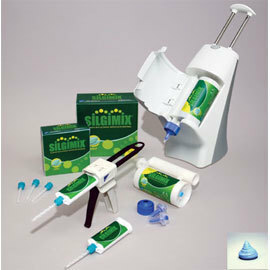 Silgimix™ is packaged in a disposable 380ml cartridges for automatic mixing machines and 50ml, 1:1 ratio cartridges for S-50 dispenser guns. Silgimix™ sets fast with an intraoral set time of just 3 minutes and has a patient pleasing mint flavor. Fast intraoral set time of just 3 minutes saves valuable time and keeps patients happy. Silgimix™ impressions are easily disinfected with Sultan’s Sporox® sterilizing and disinfecting solution or other recommended chemistries, eliminating contamination issues often associated with traditional alginate materials. Handling time: 4 business days.